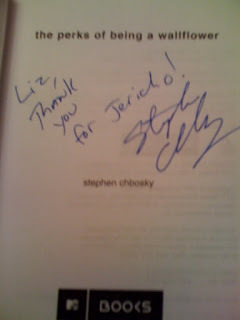 An F in Stephen Chbosky. An F, for total failure as both pop culture guru AND as young adult lit expert. How come none of you told me that Stephen Chbosky, author of The Perks of Being a Wallflower , is also the Stephen Chbosky who is the creator of the TV series Jericho ? Links to my Jericho posts: Jericho, uh oh its cancelled, but it came back for a final season. So, guess who was at ALAN (and when I have more time I will totally do a post about the awesomeness of ALAN)? Which is how I found out about Jericho. And was then a total, embarrassing myself fangirl. Please tell me you yelled at him and told him to write some YA books in between TV shows. Fangirling works, huh, Liz?? You single-handedly saved a show. AND got props for it. Well done, you. I didn't know that either, Liz. So glad that you got to meet him and be a fangirl. Very cool! If it makes you feel better, I didn't know that either. And as to the fangirl stuff, I don't blame you in the least. I think they like fangirls, at least until it crosses into the area of that one girl from Supernatural who wouldn't stop leering at Sam, although who can blame her?